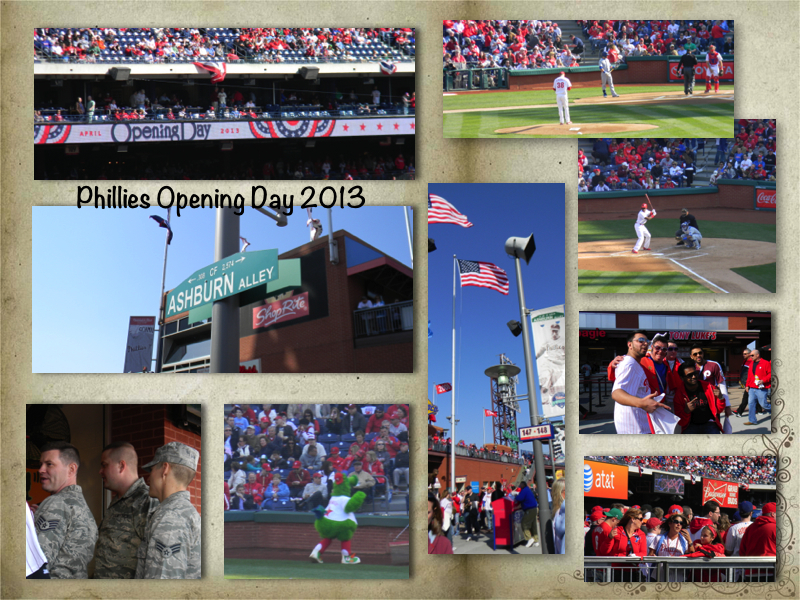 The Phillies Home Opener was this past Friday, April 5th. I've spent most of the past 20 years, give or take a year here or there, attending the Opening Day game. The weather is usually cold; so cold we've had to wear layer upon layer of clothes and coats, scarves, gloves, and bring blankets. I can remember maybe 3 years, this one included, when the weather was nice enough to only wear a sweatshirt. I can only remember 3 or 4 home-openers where the Phillies actually won the first home game of the season. This year, like so many others, they lost, disappointing the throngs of Phans and stamping out the fire of our enthusiasm. Baseball, a six month sport, starts in out in Spring, with the promise of a new season. It heats up in summer, filling our long idyllic days with with stats and purpose. Come fall, as the days begin to chill and wane, the season winds down. If we are lucky, as we were in 2007, 2008 (WORLD SERIES WIN! ), 2009 and part of 2010, we get an Indian Baseball Summer, taking us to the end of October with the post-season play. I don't feel particularly jazzed about this year's Phillies' Line-up. The core players (Howard, Utley, Rollins and Chooch) are old and broken. The bullpen seems as shaky and weak as ever. The starting pitching, well, outside of Lee and Hamels, isn't as strong as it should and could be. Roy Halladay seems like an enigma - we aren't sure that he's all there and in good shape. Something's not being said about him and his arm. Kendrick, well, I'm not sure he's even worthy of being even a 5th starter. But what do I know? I regurgitate what I hear on sports radio, WIP and Sports Talk, and what Rabbi Stone and Liz tell me. I do know that I can sense that the Phans aren't as into the team as we've been in years past. How many more times does Rollins need to swing out at the 1st pitch? Howard, stepping up to bat, with no emotions and just gets "caught looking" at strikes like he did in those final playoffs game of 2009 and 2010? Unlike the Yankees, which spends and gets the best players, decade after decade, and then produces hits, saves and WINS, the Phillies don't ever seem to be in the top tier league of really wanting and making the serious commitments to being a world class team. Management didn't do enough to get enough good players on the team or in the pipeline down in the minors in in farm system to shore up our future. We didn't buy our season 17 game pack this year. We didn't even commit to a 6-pack. We were able to buy the opening day seats this year, because I suspect, that the Phillies aren't selling any games all that well. I got a "come-on" at work as a group sales person from the past year. Opening day seats were available without having to buy anything else. Just 2 tickets, fairly good seats. I hope the glory days of our team aren't behind us, leaving Phans with the long dry stretch of disappointing seasons, as we experienced from 1993 to 2007. I hate to be proven wrong, but in this case, I'd be happy to have The Phillies do an I told YOU SO, as opposed to me saying, I TOLD YOU SO that the Phillies aren't all that. We've got 156 games left out of the 162 season games. There's a lot more happy days ahead.